Under the guidance of WCC's Kasun Munasinghe, the Winterthur Cricket Club are offering members, their friends & familes the chance to experience the delights of authentic Sri Lankan cuisine in the company of other club members. Insanely popular in Sri Lanka! Chopped flatbread mixed and mashed together with chicken/lamb and vegetables and lots of aromatic spices, this chicken kottu roti recipe is as delicious as it is comforting. A rustic flat bread made up of flour, grated coconut with diced green chillies and inions for extra texture. This will be served with milky dhal curry and lunumiris(Sri Lankan chilli paste). A coconut custered pudding made of coconut or condensed milk, jaggery, cashew nuts, eggs and various spices. Note : A donation box will be smiling at you looking for the funds for a bowling machine. Don`t bring coins! 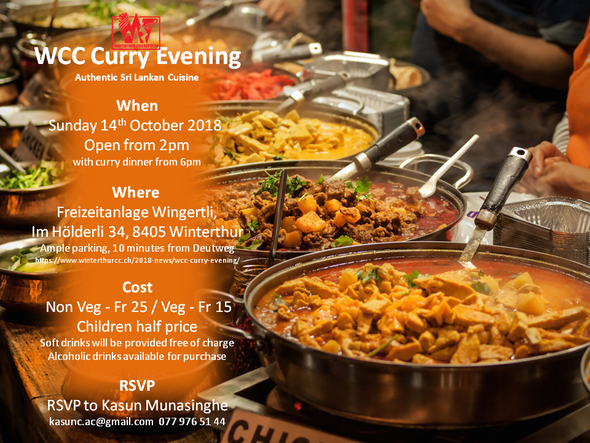 To confirm your attendance you can either complete the WCC Curry Night Doodle or contact Kasun Munasinghe by email or telephone at 079 976 51 44 with your specific dietary requirements. 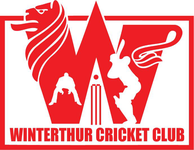 From WinterthurHB take the no. 3 bus in the direction Oberseen. 3rd stop after Deutweg/Eishalle is Etzberg. It is a 5 minute walk from there. Cross the road at the pedestrian crossing and walk passed the tennis courts on the left. Turn left into Im Hölderli. The Freizeitanlage is at the end of the road, 25m left of the pedestrian underpass. Pass Deutweg and drive straight ahead at Etzberg roundabout. Turn first left into Im Hölderli and follow road around to the right at the end (right of the pedestrian underpass). The Freizeitanlage is at the end of the road.